Living on the Isle of Man, the logistics of any trip to Scotland have to be carefully thought out. I decided that the best way to Stranraer, due to the timing of flights and ferries, was to fly to Belfast the night before starting the walk and then take the Stena Line fast ferry to Stranraer first thing on Friday morning (the 18th). 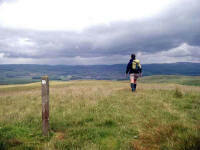 The original plan was to then walk for ten days and reach Galashiels, using SouthernUplandWay.com as support. This company offer accommodation booking and baggage transport services - for an occasional walker like myself this would have the considerable benefit of allowing me to carry a small lightweight rucksack. This had to be modified when I picked up a persistent ankle injury (when walking the Raad ny Foillan coastal path on the Isle of Man as preparation). I decided to only walk three days at this stage, as it wasn't clear whether my ankle would stand up to many consecutive days of hard walking. As I would be walking alone I didn't want to risk being forced to limp slowly when several miles from help, and walking slowly in discomfort isn't my idea of fun! The weather in Belfast was remarkable - 26 Celsius in the city centre that evening. In these summer conditions, the traditional perception of Belfast being a grim place full of dour people was well and truly shattered. Groups of Japanese tourists mingled with Belfast residents sunbathing on the lawns outside the City Hall, and the atmosphere was more Madrid than Northern Ireland. As it was my first trip to the Emerald Isle, I did seek out a pint of the Dublin-brewed Guinness - much better than the Park Royal version I'm used to avoiding elsewhere. In the morning, I used the Stena Line HSS to Stranraer, which takes a very pleasant and comfortable 90 minutes. I was welcomed at Stranraer by bright sunshine, and Claire of SouthernUplandWay.com, who was to transport me to the start of the walk. 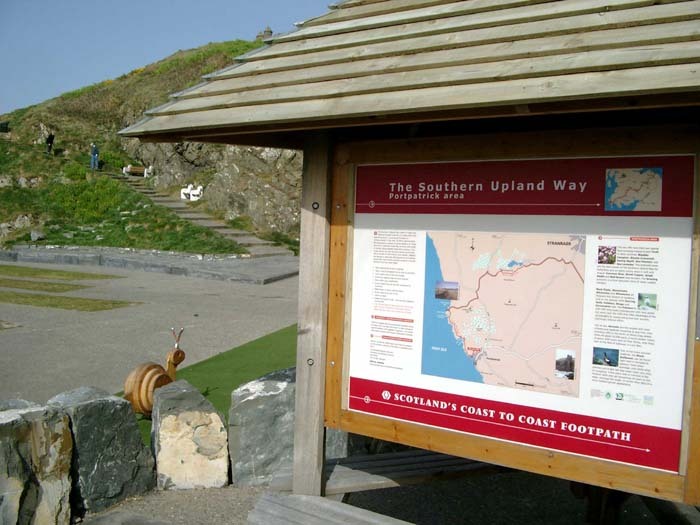 Although the E2 begins in Stranraer, I'd decided that the first section of the Southern Upland Way should not be missed. 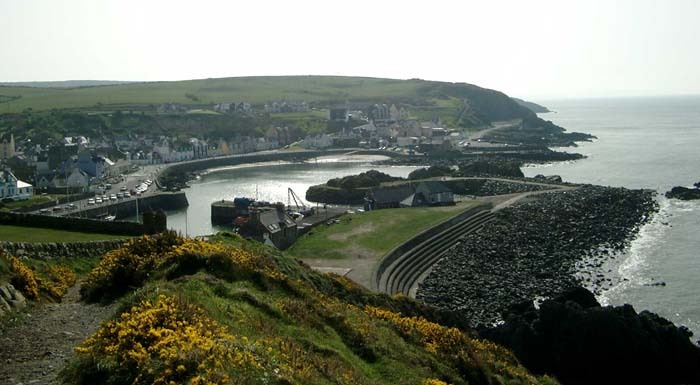 It begins in Portpatrick, eight miles to the southwest, and skirts Stranraer as it heads towards Castle Kennedy. So I was off route already - but the diversion was well worthwhile. 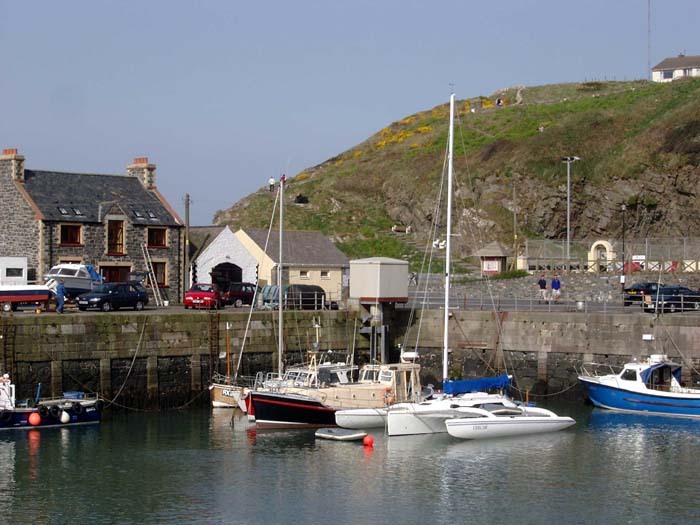 Portpatrick is a fishing village with a harbour which has a history out of proportion to its small size: there is only a narrow (but treacherous) stretch of water between the harbour wall and Northern Ireland. 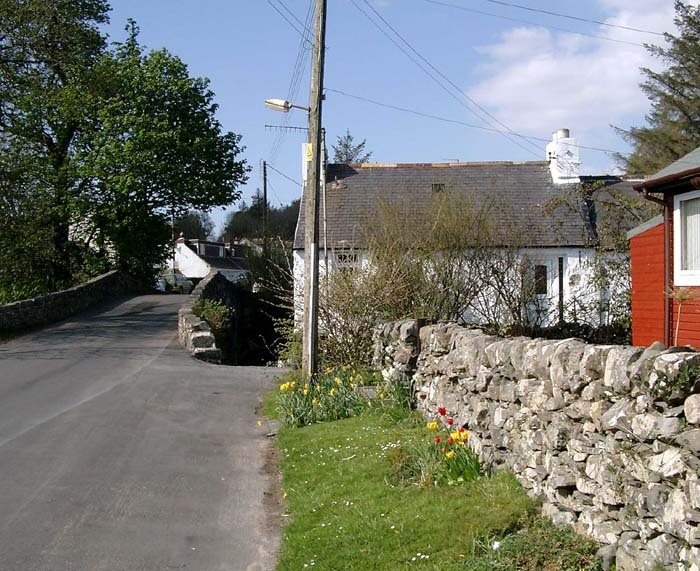 In the warm sunshine, the village had a relaxed and friendly atmosphere and I had a look around before making my way to the steps which start the Southern Upland Way. 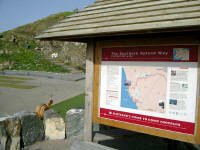 At 10.30, I climbed the steps onto the cliff top and began the long walk south, in a north-westerly direction. 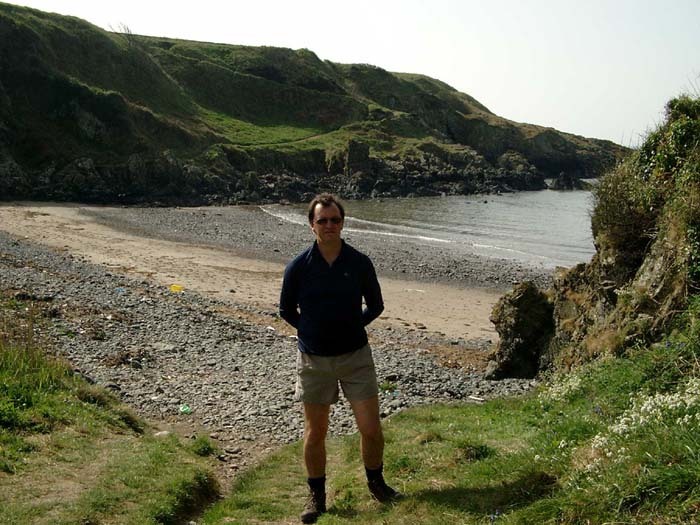 By the time I reached the small, stony beach of Port Mora (Sandeel Bay), I realised that long trousers were going to be far too warm, so on came the shorts. My ankle was already quite painful, so I was pleased that only thirteen miles of easy walking was ahead. From Port Kale, the path rises so steeply that chains have been set up to allow the walker to haul himself to the top. The next mile is easy walking along clifftop meadows overlooking the sea, which is heavily coloured by the dissolved greywacke rock which dominates the geology here. At Black Head lighthouse, the Way turns inland, settling into its general east-north-easterly direction as it heads for the east coast at Cockburnspath. 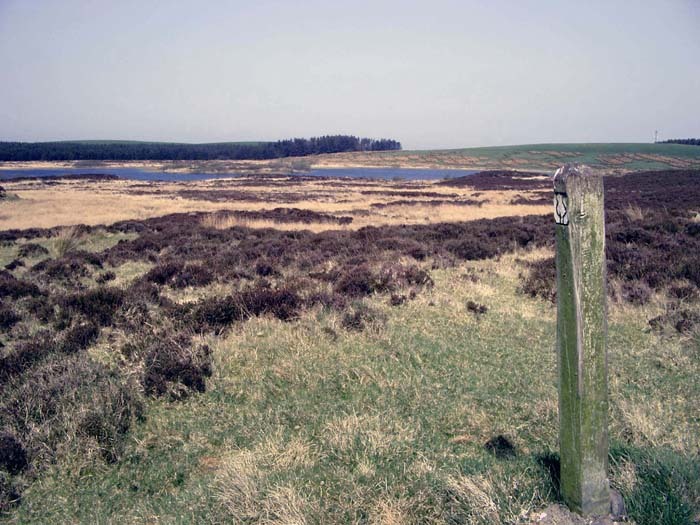 The character of the land quickly turns into moorland at the tiny settlement of Knock and Maize ("Hillock and Bog") before passing to the south of Stranraer. 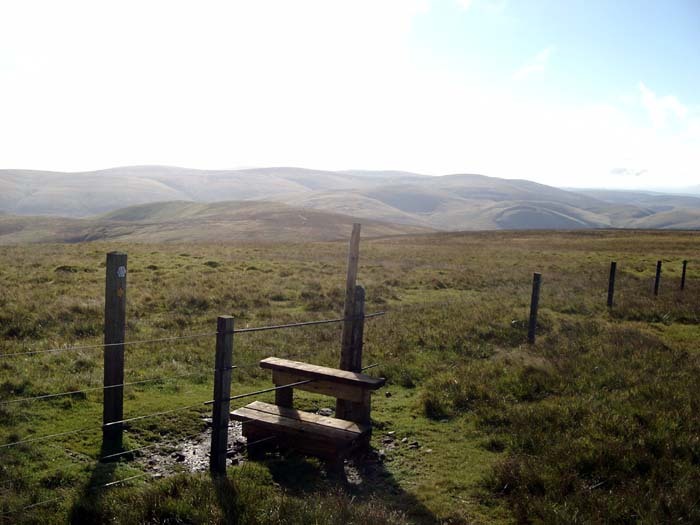 An interesting feature of the Southern Upland Way is that it is possible to collect "waymerks" at various secret spots along the way. 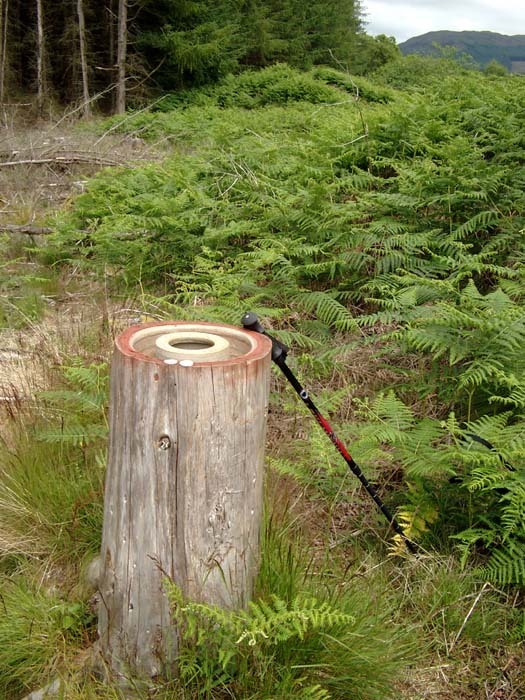 There is a clue near the location - this may be difficult to notice in itself, and I found that the waymerk "kist" is not always obvious even when you know that there is one nearby. There is one on this first section, but I can't say where (mostly because I didn't find it!). Use this link to find out more: Waymerks.org.uk. From the A77 south of Stranraer, the E2 follows a pleasant series of back lanes through the Culhorn estate to Castle Kennedy. Even though I'd taken my time, it was only half past three when I arrived at Castle Kennedy. The ankle injury, after months of pain, had mysteriously disappeared and was not to trouble me again - it seems it just needed warming and stretching. 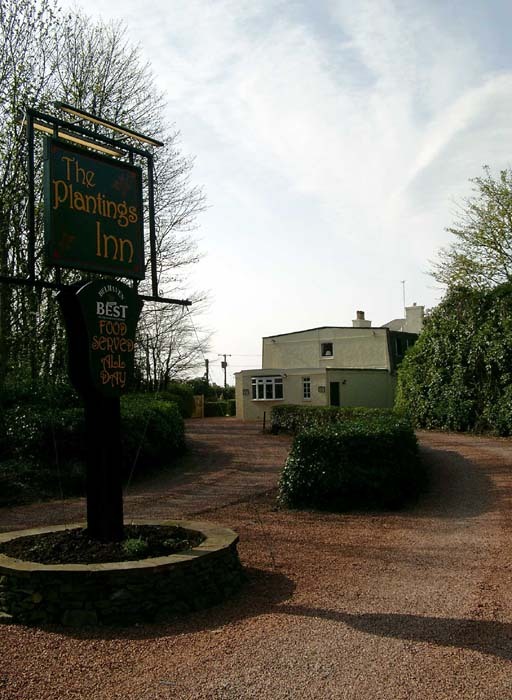 The Plantings (when it eventually opened) was a good place to stay with good food, beautiful gardens and clean rooms. Although it has a bar, the proprietors are obviously encouraging the eater rather than the drinker, however, as visitors who didn't want to eat were politely shown the door. 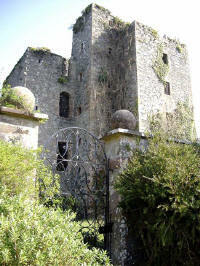 After a good breakfast, I walked back to Castle Kennedy and entered the Castle gardens after paying the admission fee. With only eleven miles to walk, I needed to take my time - especially if all the pubs and hotels were going to be closed until five o'clock. 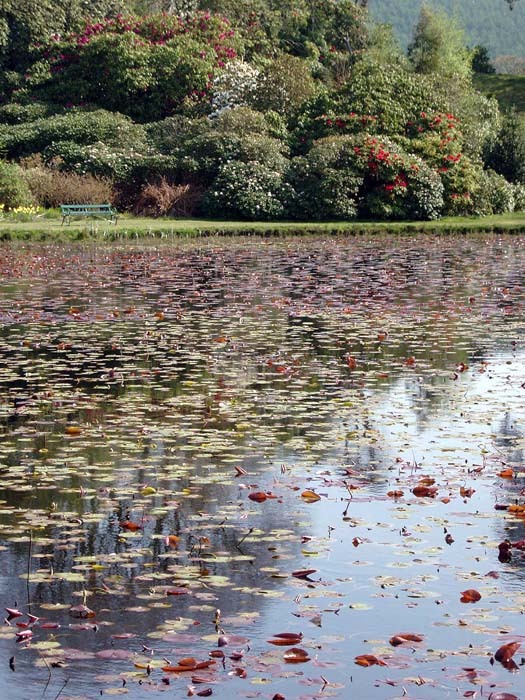 The gardens are worth a visit, with a castle ruin, rhododendron walks and a lily pond. 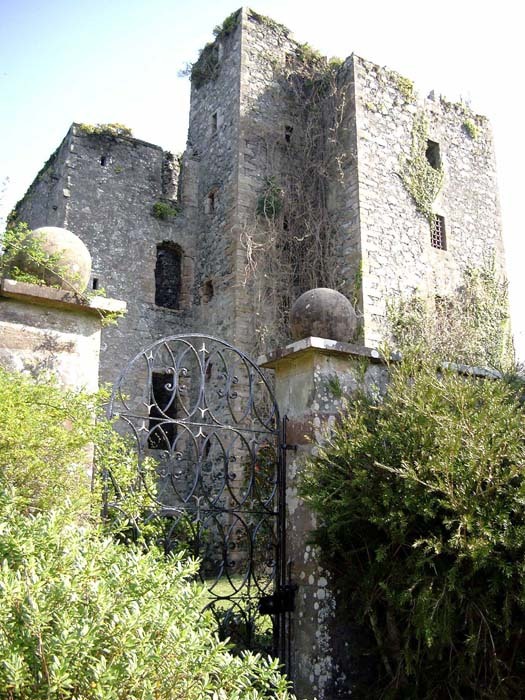 The once-powerful Kennedy family had to sell the castle in the 17th century after their support for the Covenanters had led to financial problems. 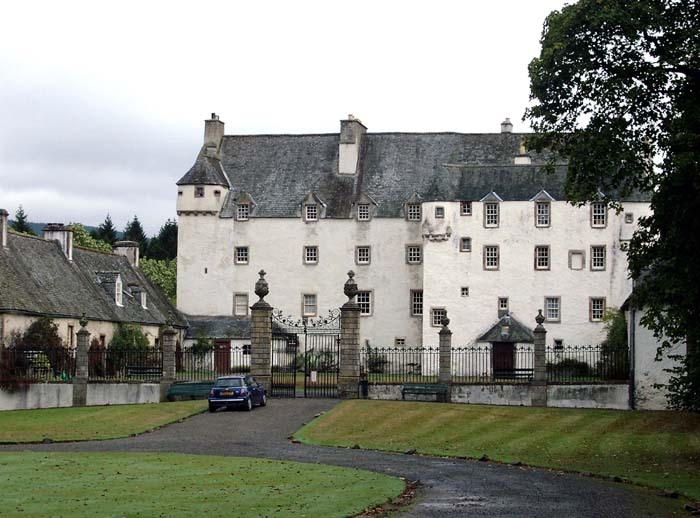 The current landowner (the Earl of Stair) lives in the nearby Lochinch Castle. 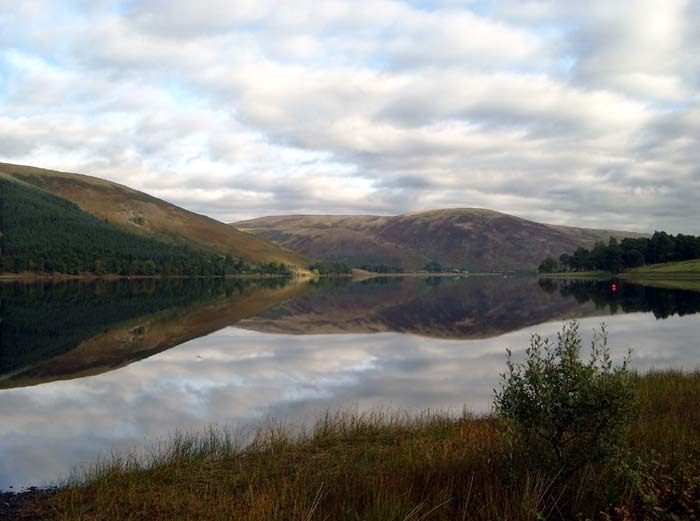 The Black Loch is unusual in that it contains an artificial island called a crannog, which was populated in prehistoric times. 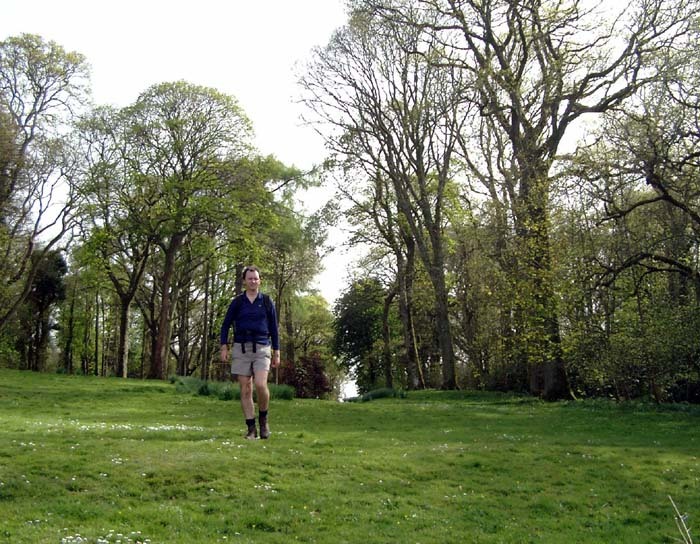 East of Castle Kennedy, the Way rises into a more upland area which is heavily forested. The map I was using showed a variation of the path which is not now used - unfortunately the new route has a dearth of way markers for a couple of miles, and, assuming I was off route, I spent an hour retracing my steps and attempting to follow the old route. Eventually I saw a couple of people in the distance heading towards me and I allowed them to catch up with me, thinking that they may point out where the path should go. It turned out that they had seen me and decided to catch me up and ask where the path was! They were a friendly couple, and I had already decided that my original route was correct so I walked on with them to where we could re-join it. They returned the favour by finding a Waymerk kist which I knew was in the area but couldn't locate. By three o'clock, despite the delays, I was at the remote, abandoned farm of Kilhern. This bleak spot overlooks the valley of the Water of Luce, which contains my destination for the day, New Luce. I walked on to New Luce, where I was relieved to find that the Kenmuir Arms was open and by luggage was waiting for me in my room. The Kenmuir Arms was a friendly inn with good rooms, and the kind of food which is reasonable value for money although best described as "Pub Grub"! After the non-stop sunshine, it was a shock to see South-West Scotland with the more traditional grey skies which seem to wash all the bright colours out of the spring scenery. After another full fried breakfast, I was marching back up the road to where the Way turned away from New Luce. 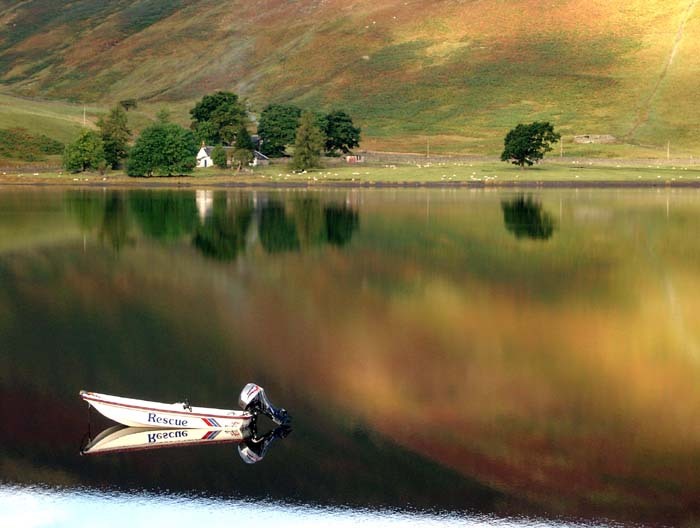 Today would be a stiffer challenge, with some real hills, a longer distance and more remote country. The road ends below Balmurrie, and a remote region is crossed between Balmurrie and Knowe, with several relics of old civilisation. The first of these is the Purgatory Burn, where the lepers washed themselves on the way to the colony of Liberland. Soon afterwards, there is the ancient site of Laggangairn, with standing stones thought to date from about 2000 BC. 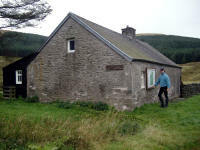 There is also a bothy here, in a "beehive" shape - a pleasant place to stay I'd imagine. The visitors book indicated about two or three people passing by every day (those who signed the book, anyway). This was hard to understand as I hadn't seen anyone who appeared to be engaged in the Southern Upland Way since the start. I left Laggangairn at about 11.15, and for the next hour and a half kept up a good pace over a wide landscape of forestry and undulating hills. 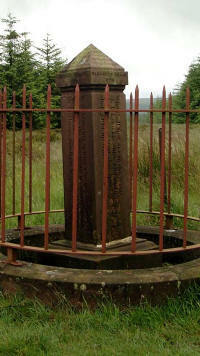 This whole area has a history of religious conflict - in the 17th century the population tended to support the Covenanters in their disputes with the authorities, which often ended with the ousting or even murder of the rebellious ministers - the site of one of the murders is passed in this section, the grave of Alex Linn. 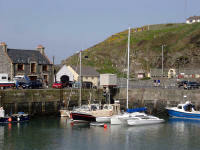 With a good track, I was six miles further on at Polbae for lunch at a quarter to one. 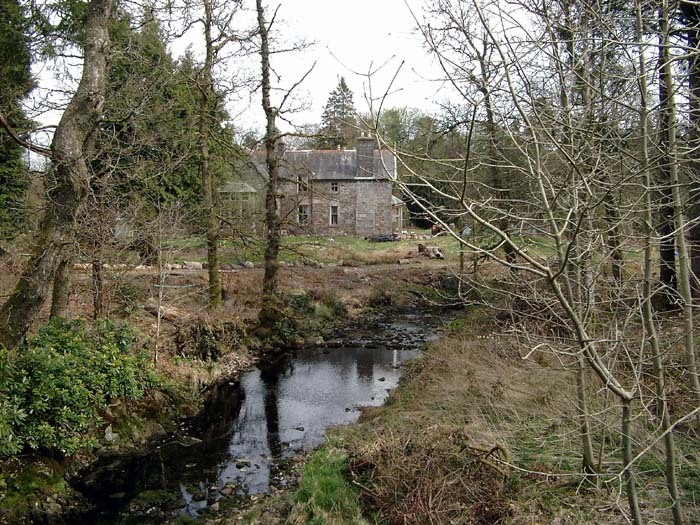 The house at Polbae has a slightly wistful atmosphere: there was obviously a family living here in some style, with rowing boats on the small pond in front of the house and an inscription nearby celebrating the 21st birthday of Marmaduke Septimus Fox in 1913. Now the house appears to be empty, though still in reasonable condition. As the weather had brightened a little, I lay down in the grass and ate a lunch of banana and Mars Bar. Another half-hour of easy walking took me to the hamlet of Knowe - a significant settlement round here although little more than a telephone box. The path here plunges off the road into mixed woodland - the guide warns that it is boggy, but the spring of 2003 was very dry and I was spared any seriously damp ground. 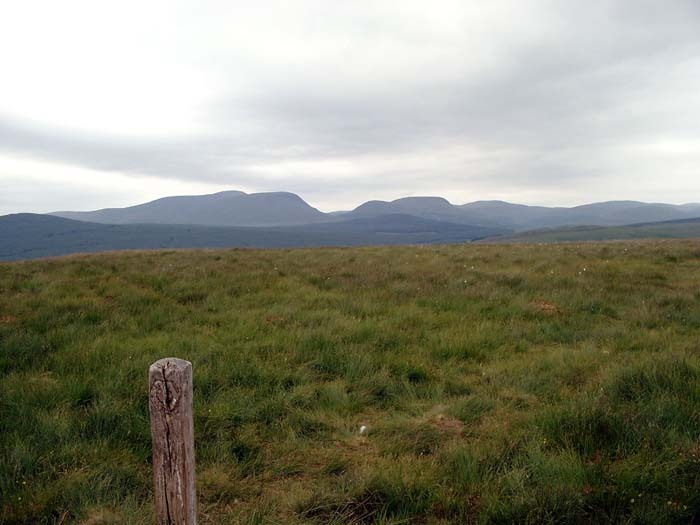 The next few miles past Loch Ochiltree are much more open, with great views back to the fells crossed earlier - already looking quite distant. 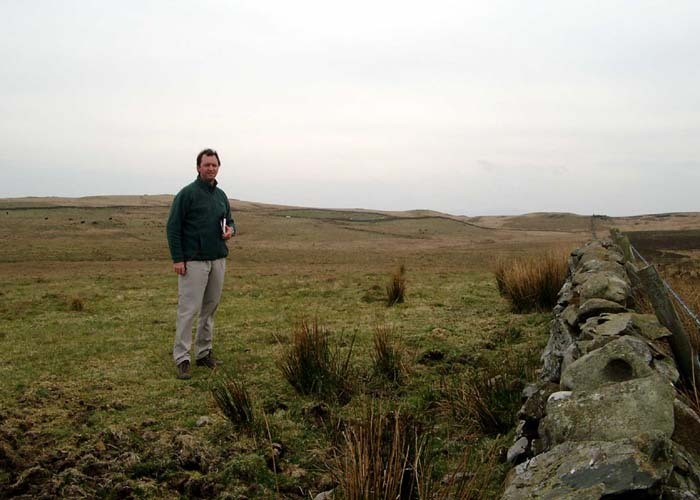 The summit of the Hill of Ochiltree leads down towards Bargrennan - not without difficulty though, as cattle have rutted the surface of the ground severely around here. Again, I was going to reach my destination early as it was barely half past three on arrival at the House O'Hill Hotel in Bargrennan. The landlord expressed surprise at my early arrival and showed me to my room. The inn has been sold since I stayed there, and had the appearance of being run down ready for imminent retirement - the food and drink was pretty basic, as was the decor apart from the bedroom which was bright, clean and welcoming. This was to be my last night before returning to the Isle of Man - regrettably as I was now feeling quite fit. Fortunately the next day quickly turned very wet, and I didn't feel too upset to be making my way back south. The best way to get back to Bargrennan from the Isle of Man appeared to be via Prestwick Airport. The previous trip had been a solo one - although I enjoy walking on my own, it's much better to have company in the evenings so I'd persuaded my wife Chrissy to come along this time. The plan was to hire a car at Prestwick, then for Chrissy to drive us to Bargrennan where she would leave me to walk whilst she drove to the evening accommodation at St. John's Town Of Dalry. The flight was very good and punctual - thanks, Aer Arran. We had our luggage by half past eleven and had only to pick up the pre-booked hire car. This did not go smoothly as we had a very long wait behind two Swedish groups, and we didn't arrive at Bargrennan until nearly two o'clock - about an hour later than I'd expected. This meant that I really had to walk the 18 miles in five hours, as I felt that inviting Chrissy along then not having an evening with her wasn't very fair. 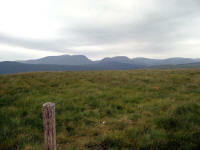 She would pick me up at Craigenbay, on the road near Clatteringshaws Loch, and we agreed that I'd get there for 7 p.m. As this meant an average speed of nearly 4 miles an hour, I wouldn't have much time for stops so I set off at a fast pace. 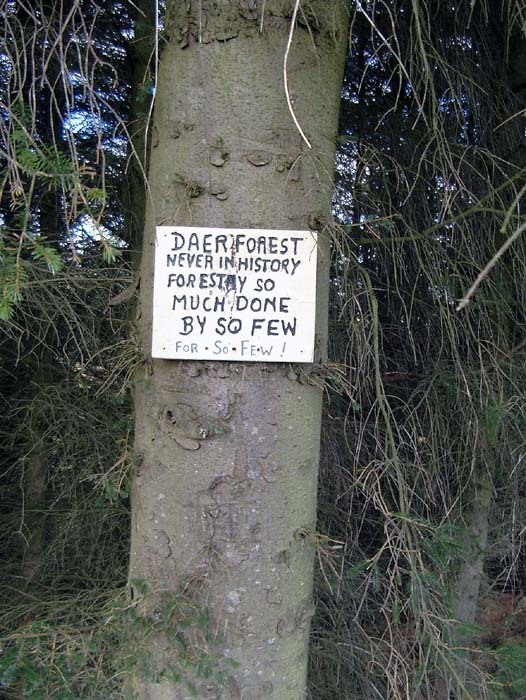 The first three miles of this section is fairly rough, in thick woodland, and has replaced a shorter stretch due to problems with the forestry company. The continuation along the Water of Trool is probably the most beautiful part of the walk so far, especially on a bright and warm summer day such as I was experiencing. Dragonflies and butterflies accompanied me, and the path led up and down small ridges and through patches of heathland and woodland as it ran towards Loch Trool. 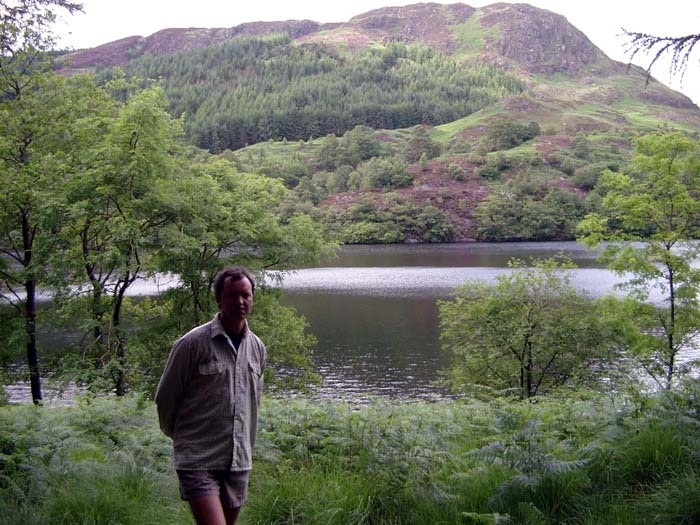 I continued through the deserted camp site and through the mature forest along the magnificent southern edge of Loch Trool. 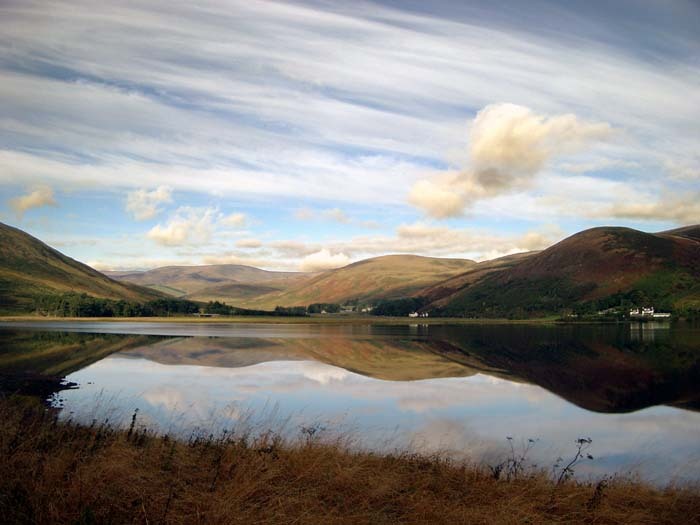 At the end of the loch is the site of the Battle of Glen Trool, where Robert the Bruce defeated the Earl of Pembroke's force in 1307. 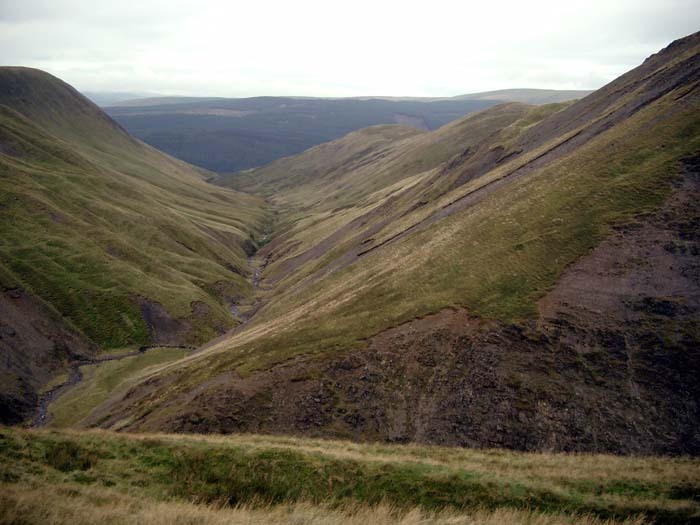 The path at the head of Glen Trool rises steeply up the hillside through boggy ground which has been badly cut up by cattle. The route formerly kept to the south-west of the burn, but is now more difficult - keeping up the necessary fast pace became quite tiring and I was glad when the gradient eased at the col. A new vista now opened up, with big plains and lochs broken by brooding mountains, all on a larger scale than earlier along the Way. 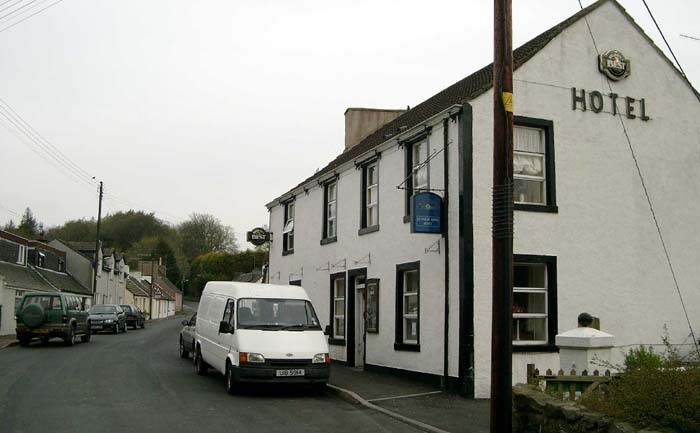 I phoned Chrissy to check that she'd found the accommodation - the Clachan Inn, which is advertised as "the home of southernuplandway.com". I had high expectations of this inn, and had booked two nights for us there. Chrissy obviously wasn't impressed with the room, although she deemed it OK, and I wasn't impressed that the staff had offered to "try" and find us a table for dinner, but couldn't promise anything as they were busy that evening. I quickly put such mundane issues out of my mind, however, as time was ebbing away and there was now a long but straightforward march ahead to meet the 7 o'clock target. 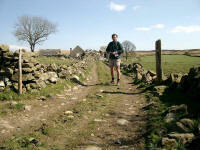 The wide track here is good for fast walking but hard on the feet as the surface is stony. 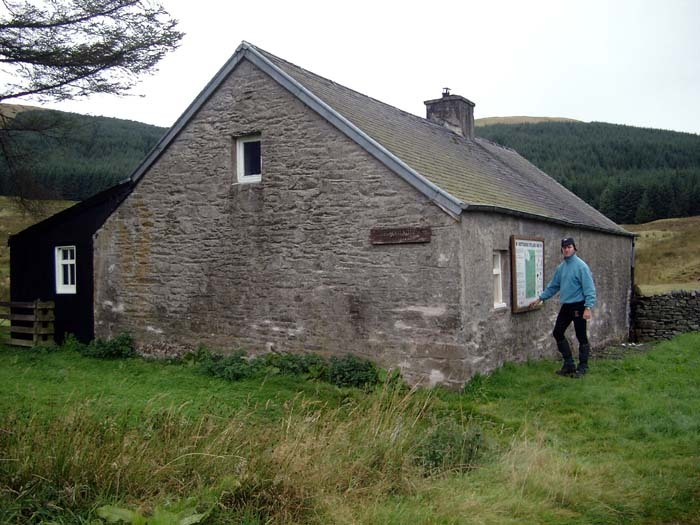 A long distance cycle route shares the way - a bike would have been a better way to travel from Glen Trool to Craigenbay. With an hour and a half left I was at the side of Loch Dee, seven miles from the pick-up. It was a relief when I saw the car waiting at the arranged spot, and I was on time: in fact a minute early! We drove a few miles east to St. John's Town of Dalry for our first Clachan night. The evening at the Clachan Inn was pleasant enough, although our room had a spooky "death mask" issuing from the ceiling above the bed - I never found an opportunity to ask about this rather weird feature. Chrissy dropped me off back at Craigenbay at half past nine on the Sunday morning. After yesterday's rush, I was planning to keep today's walk rather sedate so we arranged to meet in St. John's Town of Dalry for lunch. This meant a stroll of about seven miles in the morning, and another nine after lunch. There was a small climb up Hog Park Strand to Shield Rig to begin with, but then only one more small hill before lunch. 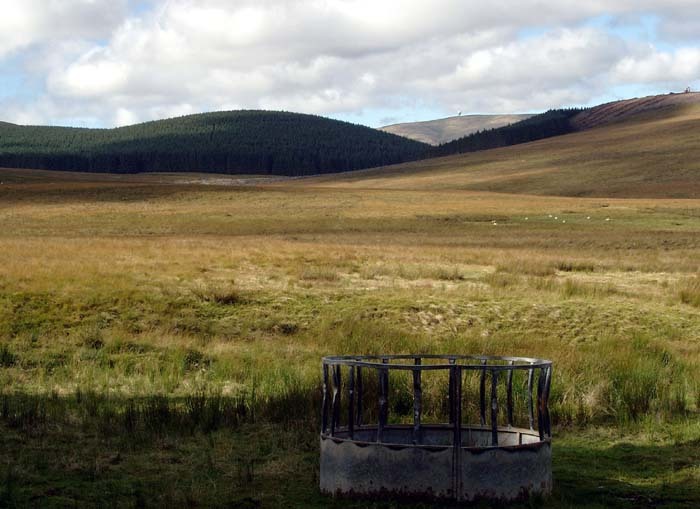 From Shield Rig, the Way gently drops past the small outpost of Clenrie, into the valley of the Garroch Burn. Just past Clenrie, a buzzard sat on a telegraph pole just ahead. By the time I'd retrieved my camera from the rucksack it had flown away, but it followed me for another mile down the valley, calling and swooping a hundred feet above me. 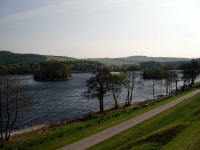 The lower part of the Garroch Burn is quite idyllic as it passes through the alders of Hannaston Wood, but the Way soon cuts across Waterside Hill to the surprisingly picturesque Earlstoun Hydro-Electric power station tucked away at the side of the Water of Ken, with a spectacular fish ladder. The path continues from here into St. John's Town of Dalry via the suspension bridge. 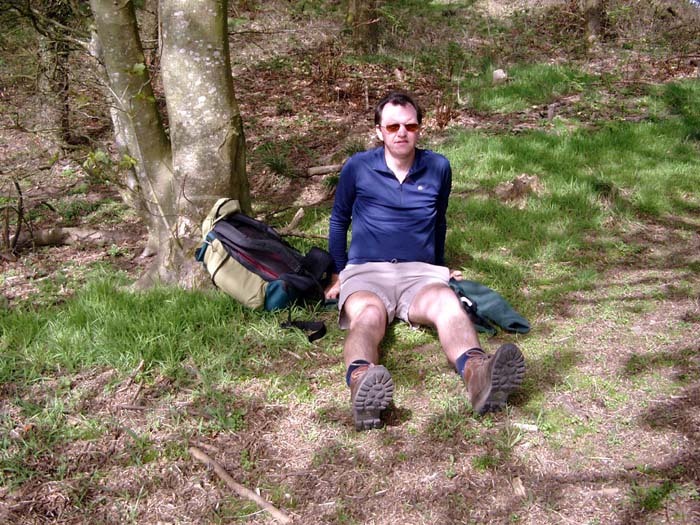 I've never had the opportunity before, on a day's walk, to break off and have a large lunch and a full rest. This time, because we were lunching and staying at the Clachan Inn, I was able to have a shower, get changed and eat a Sunday lunch, then rest for an hour before setting off for the afternoon stage. 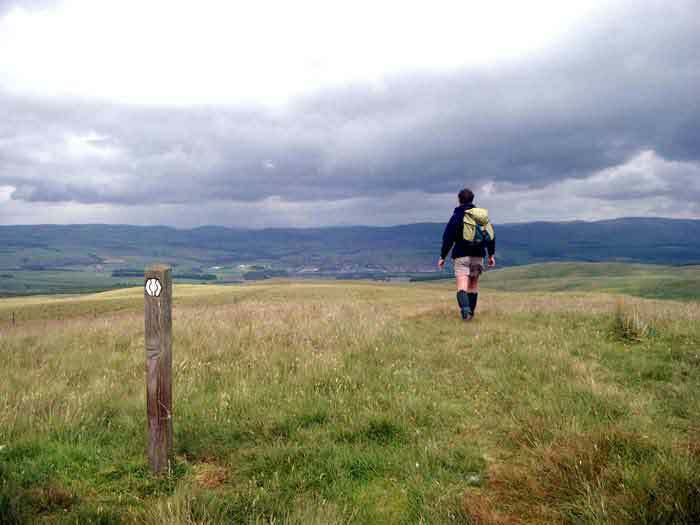 That morning we'd met a woman from Colorado who had come to Scotland to walk the Southern Upland Way, using a southernuplandway.com package. Having miscalculated the distance she was required to walk every day, she was having difficulty with the logistics of the walk, to the extent that I couldn't even decide whether she was trying to walk west-east or east-west. As a very slow walker, she was only able to manage about ten miles a day - a few sections are much longer than this so she'd come to the conclusion that her best option was to do a few sample stretches, using her support team. I passed her going in the opposite direction as I left Dalry: she was just about to complete her section from Stroanpatrick to Dalry, after which she was intending to spend the rest of the day sending e-mails from the Clachan's excellent free facility (as she had done the previous evening). The Way heads north from Dalry, across a series of low but open hills with great views of the impressive Cairnsmore of Carsphain to the north - unfortunately marred by a large wind power station on the nearby ridge. Eventually, a descent of Culmark Hill leads to the tiny hamlet of Stroanpatrick. 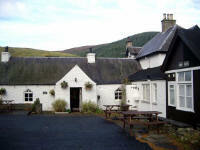 Chrissy was waiting here, and we drove back for our second night at the Clachan Inn. After the hefty Sunday lunch, I knew we weren't going to want yet another big meal so I'd checked that bar snacks were available in the evening. Eventually we managed to obtain said snacks, but only after an hour of confusion and negotiation: I guessed that the Clachan's landlord was away as I can't believe that they're always so disorganised. 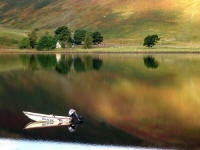 Sometimes, perhaps the camping alternative wouldn't be such a bad idea! After so many days of fine weather there had to be a downpour, and the Monday morning welcomed a torrential one. My expensively-acquired Lowe Alpine waterproofs were now going to have to earn their keep as I wasn't going to let heavy rain interfere with my progress. So Chrissy left me to struggle through the mist and streams of Manquhill Hill above Stroanpatrick while she took a leisurely drive to Dumfies and Sanquhar. I'd been looking forward to this section as it's the first time the Southern Upland Way gains some real height, and the views would have been magnificent. 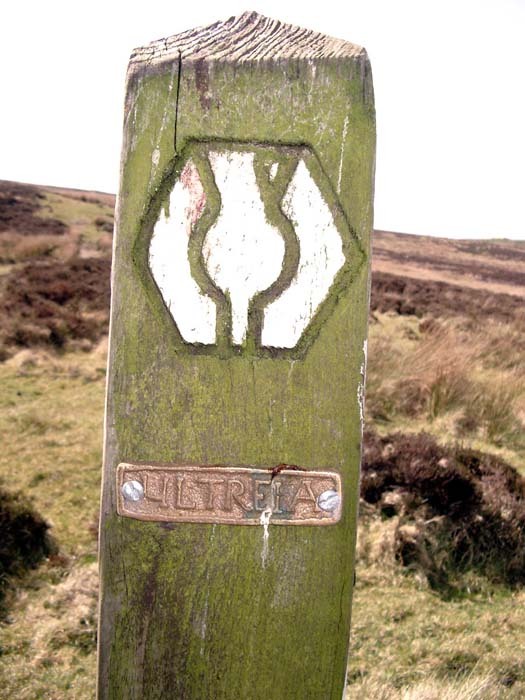 The ascent of Benbrack was merely an exercise in navigational skill though, as the mist swirled thickly and for once the wooden posts marking the Way were widely spaced and the path vague. 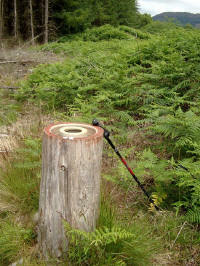 I reached the summit without incident, but was glad of the compass as the route turns sharply here. Although the rain was easing into drizzle, visibility was still poor and it was essential to keep checking the bearing as the route swung north, then east, then north again. 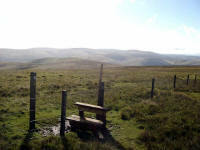 After Black Hill, the clouds suddenly broke, giving tantalising views of sunlit hillsides in the west. I caught up with a couple of walkers as I approached the forest above Polskeoch - they turned out to be the dour Scotsmen who'd also stayed at the Clachan. The leader was monosyllabic, then I realised that he was following a complicated series of compass bearings and didn't want to be distracted. By now the sun was breaking through and my compass work consisted of the occasional glance to reassure me that I hadn't taken an path fork in the woodland. 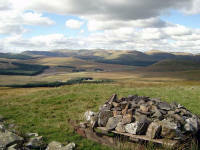 I stopped at Allan's Cairn and had lunch, allowing the others to pass - I never saw them again. 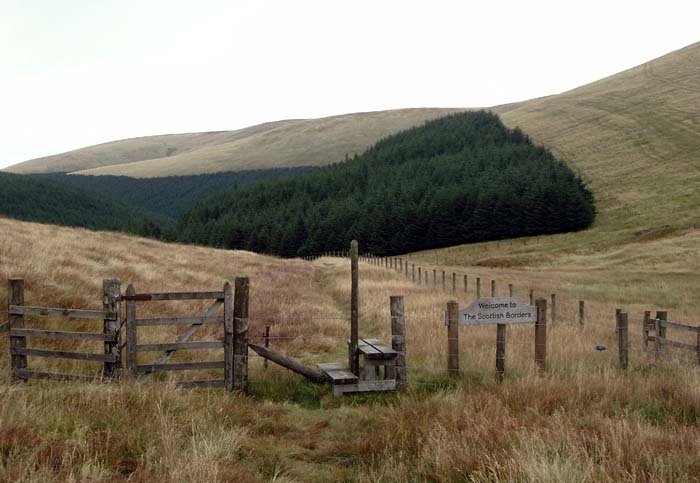 The descent from Allan's Cairn through thick forest quickly meets a forest road, which becomes tarmac at Polskeoch, past the bothy - an option for basic accommodation. The steady road walk to the pretty sheep farm of Polgown was in bright, warm sunshine - the waterproofs had been stowed away and it was back to the shorts for the grind up Cloud Hill. The gently sloping meadows of Whing which followed were welcome as they were downhill (but not too steep) and, importantly, soft underfoot. 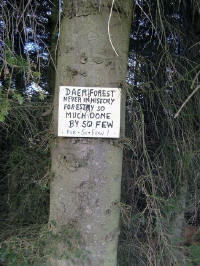 Much of the previous two days had been on hard, stony forest roads which jar the legs and tire the joints. 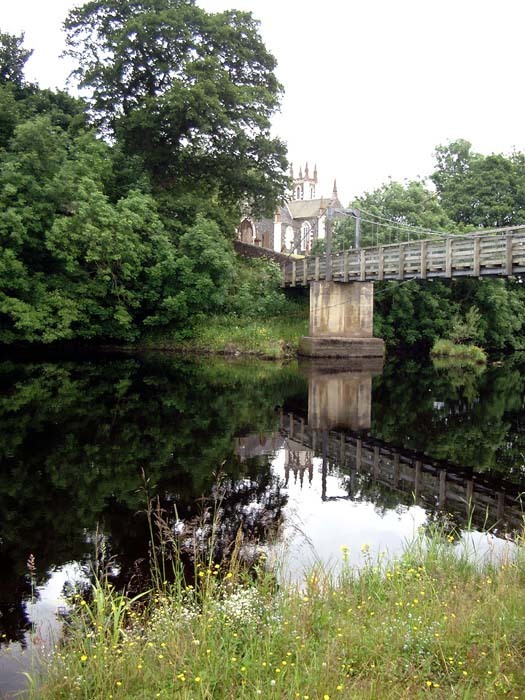 Eventually, I reached the large farm of Ulzieside, crossed the River Nith at Blackaddie Bridge, and turned left into the grounds of the Blackaddie Hotel, our accommodation for the night. I'd already spoken to Chrissy to make sure she would be there in time as I was early again, and she met me at the hotel at about half past three. The hotel was a little more expensive than the previous ones, and was worth the extra money as it was in a tranquil spot and very welcoming. We had a brief visit to Sanquhar - a rough mining town, quite a surprise after the rural areas to the west, then a very good dinner. The American woman was there, after having had a rest day and a lift east (although I think she was walking westerly). The latest variation of the route to the starting point was across the Irish Sea to Heysham, then a drive up the M6 and A74 to reach Sanquhar. This time, with only a short walk, I was able to start mid-afternoon and finish early evening without needing to hurry. The Way rounds Sanquhar on the southern side, past the ruined castle, then through the village ("the oldest post office in Scotland") until it leaves round the back of industrial buildings and out into open hillside. A civilised footpath on fine turf leads up past benches to a flagpole, then past Bogg to wilder country to Cogshead. An alternative here takes a long diversion on a better track, but the main route straight over Glengaber Hill is an easy climb on a fine September day. 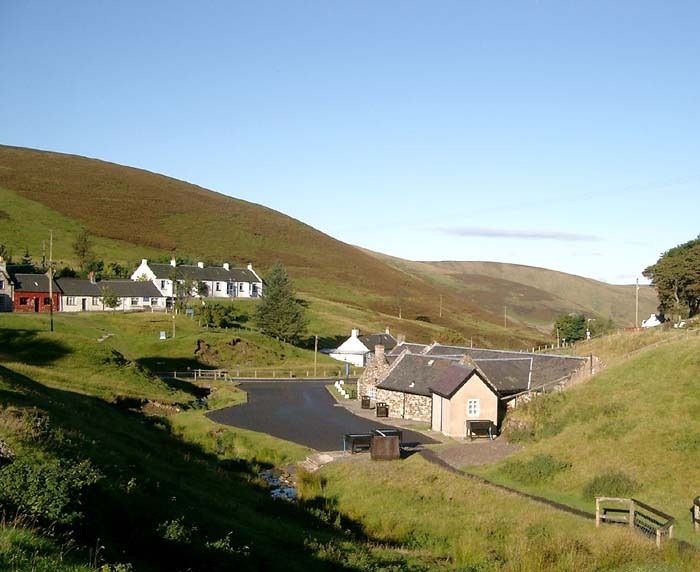 On the descent, I walked for some distance with a German from Hamburg, who was going to stay at the Youth Hostel in Wanlockhead. 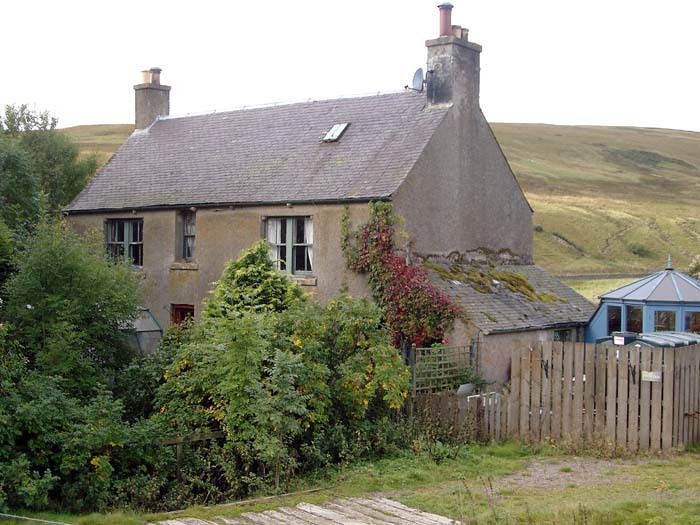 I was to meet Chrissy at the cottage we'd rented for the night in Wanlockhead - I wasn't sure which one as we were to be told on arrival. The landscape quickly changed here, with an abundance of mining detritus and spoil heaps - the weather changed to suit, with heavy cloud making the road through the village dark and dismal although the cottages were cosy and friendly looking. The Way follows the southern bank of the stream, and across the other side I spotted Chrissy waving from the window of the cottage - that saved me some time trying to find the right one. Nevertheless, a local man sitting on a wall insisted that I was lost and tried valiantly to get me to admit as much so he could give me directions. 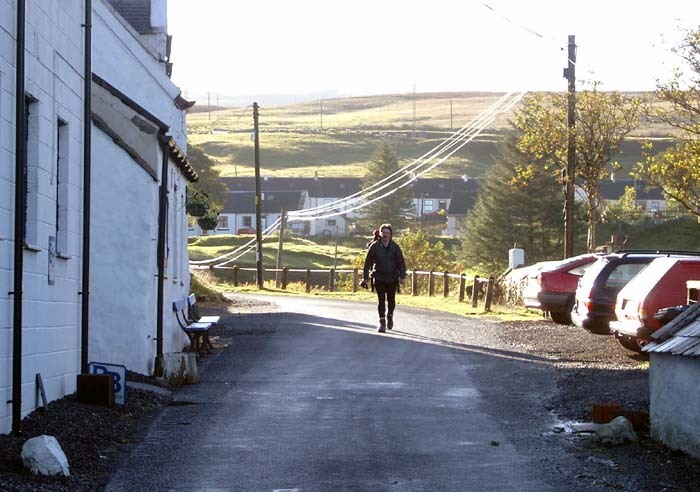 We'd brought food with us (and wine) - there's no pub in Wanlockhead and even the Local Shop was due to close down. 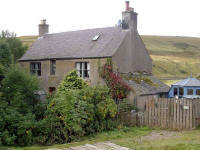 With a large cottage to ourselves, though, we had an enjoyable evening and a comfortable night's sleep. Thanks to Mrs. Jenkins! Wanlockhead is distinguished by claiming to be the highest village in Scotland, so I was expecting grim weather as the forecast was quite poor. The morning began with bright sunshine, however, so I was keen to get moving while it lasted and I only spent ten minutes looking at the village as I walked past the lead mining museum and on a good tarmac path alongside a pretty burn. 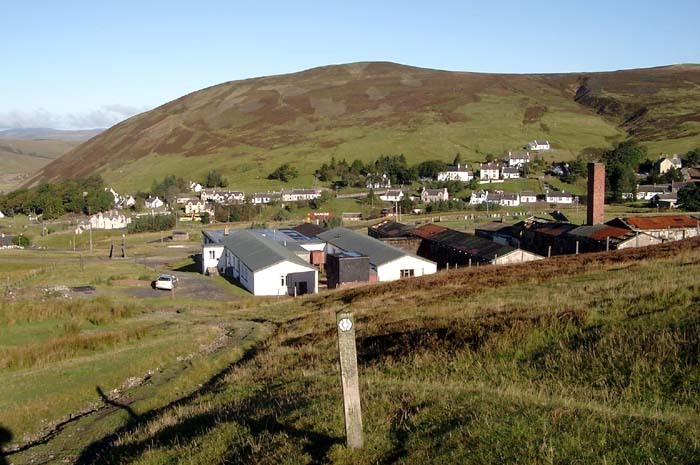 By the time I'd cut across to where the path actually went - steeply up the side of Stake Hill, it was half past nine and yet I was still in Wanlockhead. With a good distance to go, and a promise that I'd meet Chrissy near Moffat at half past four, I had to attack the hill with some verve. 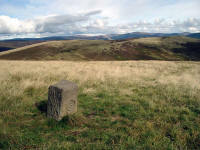 The next two miles would lead to the highest point on the Southern Upland Way, Lowther Hill. Mrs. Jenkins had warned Chrissy that this was quite a climb, but it was made easier by the intervention of a road which the Way used until cutting across to the summit. Despite the sunshine, there was a keen northerly wind and I didn't intend to stay at the top for long - I strolled up to the CAA radar station (as you're not supposed to) and tried to find the path round the back. Obviously I'd missed a turnoff just before the top and was forced to retreat down the road for a short distance and try again on the "legal" side of the fence. The views from here were magnificent, and I was obliged to hang around for a while to take in the scenery. 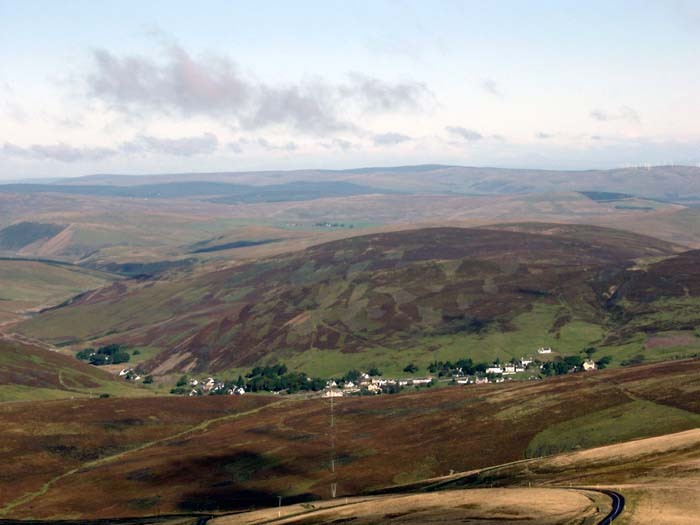 An easy descent led to a climb up Cold Moss, then down a very steep bank to the col below Laght Hill. This ascent was very steep and gruelling, and felt kind of unnecessary as there was an obvious route around the hill to the north. 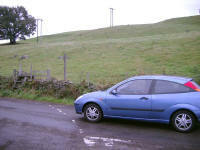 Nevertheless, I was soon over the summit and on another steep descent to the main road (A702) at Overfingland. 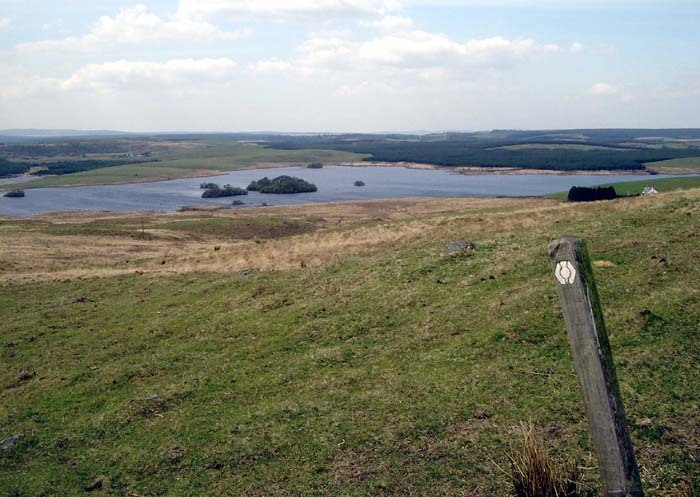 Here there was relief from the rollercoaster of the last few miles, as the path led along the road then through felled forest (with only small undulations) to the buildings below the 5600 million gallon Daer Reservoir. After this steady section, I was on schedule to reach the summit of Hods Hill for half past one. This was not gained easily, as Sweetshaw Brae is another steep hill, but only a low knoll on the ridge of Hods Hill. 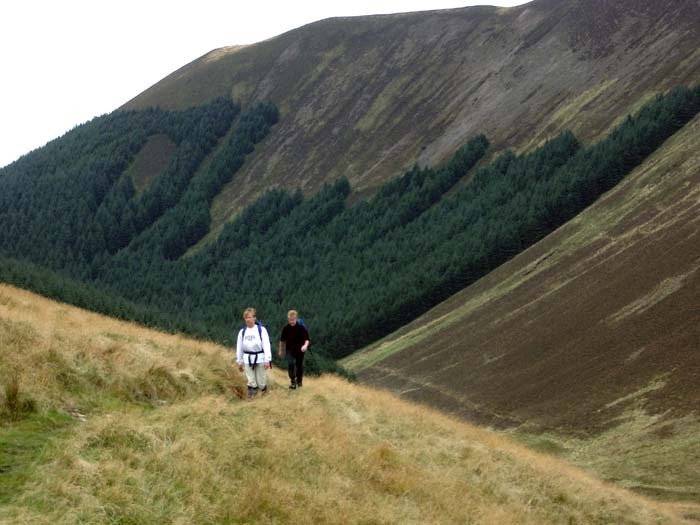 This was one of those ridges with lots of false summits, so it was a great pleasure to descend the south side of Hods Hill, knowing that the last significant climb of the day was complete. 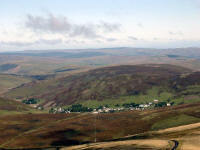 The Lowther Hills, from Sweetshaw Brae. 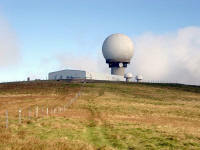 Another short but sharp climb led to Beld Knowe, on the edge of a large area of forest. The path from here drops relentlessly downwards across soaking wet ground until the forest road is reached near the Brattleburn Bothy. The road continues through the forest over Craig Hill, which was a bit more significant than I'd expected and slowed me down a little. There was a small diversion along here to avoid a couple of gigantic wasp nests which had been built at the side of the track. A few more miles of pleasant undulating walking led to the road over Beattock Hill, then across the Carlisle to Glasgow railway line. Less pleasant was the concrete bridge of the M74 which I passed under on the way to the little road past Barnhill Springs, over the Annan and to the waiting Chrissy - just on time at 4.45. We stayed at a B&B called Limetree House - recommended. Moffat is a beautiful little town: a little touristy in places as it is on the coach route to Glasgow, but with plenty of interesting shops, pubs and restaurants. After a shower and change, I walked around the town until the midges started to annoy too much (the first ones on the Way so far!). The restaurant also known as Limetree House was fully booked for the evening, so (after a decent pint in The Railway Bar) we ate at an excellent Indian restaurant (Bombay Cuisine). We were warned by the landlady at the B&B that the food could take a long time to be served - indeed, the restaurant warns the same. In the event, the food was good and worth waiting all of twenty minutes for (how could they cook it in less anyway?). At the end of the previous day, I'd noticed the short, brutal hill which followed the picking-up point. I was glad I didn't have to cross it then, but that meant it formed the first challenge of the Saturday morning. The sharp descent which followed was rewarded with a delightful mile and a half along Moffatt Water, past Dumcrieff House, home of several notables. The beech wood here was perfect: still dripping slightly from the overnight rain but glinting in the morning sunshine. Start point of day 9, at the River Annan, 9.30 a.m. 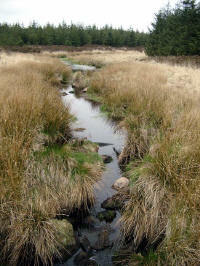 The character of the walk changed as soon as the Way left the river, becoming a Forestry trail. Entering the forest itself, the path was a steady uphill plod, with limited views due to the huge plantation surrounding the Way. I amused myself by catching up with a couple of walkers, who I joined just after we'd ignored a ludicrous forestry diversion (which encouraged the visitor to avoid potential conflict with a couple of inactive logging machines by using a steep and narrow path amongst tree roots some way to the north). I walked a mile or so with the two ladies who were also walking the Southern Upland Way in stages - they were lucky enough to live an hour's drive away so could take in a day's section with very little forward planning. 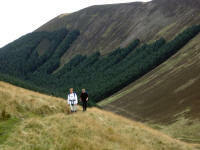 A couple of miles from Ettrick Head, the path left the forest, but remained hemmed in by steep hills. 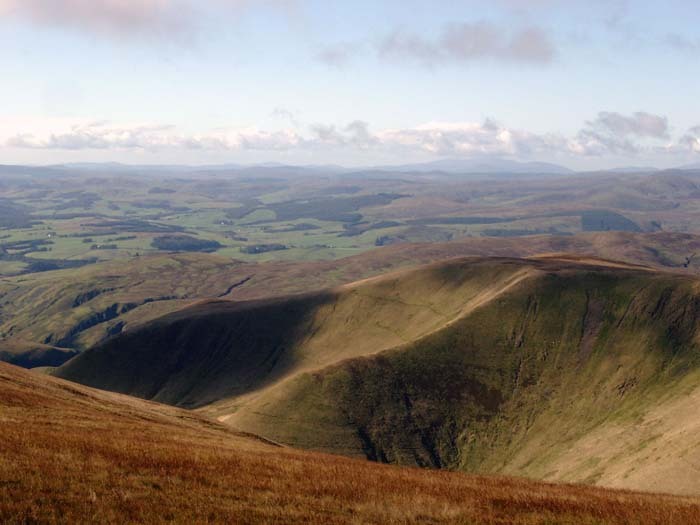 Eventually, a precarious hillside section with spectacular views down Selcoth Burn leads to the col of Ettrick Head, and the Scottish Borders. The significance of this col is that the streams from here drain into the River Tweed and the North Sea, whereas all the earlier ones drain into the Solway Firth. The path quickly picks up a forest track, which turns into a tarmac road. 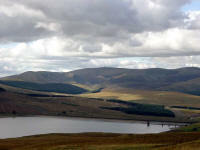 This led steadily down the Ettrick valley, allowing for a good four mph march to the pleasantly-named Scabcleuch. 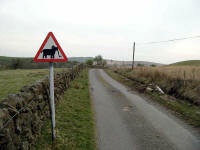 A fierce ascent ensued here, as the path struck straight up the slope above the road to the moorlands above. 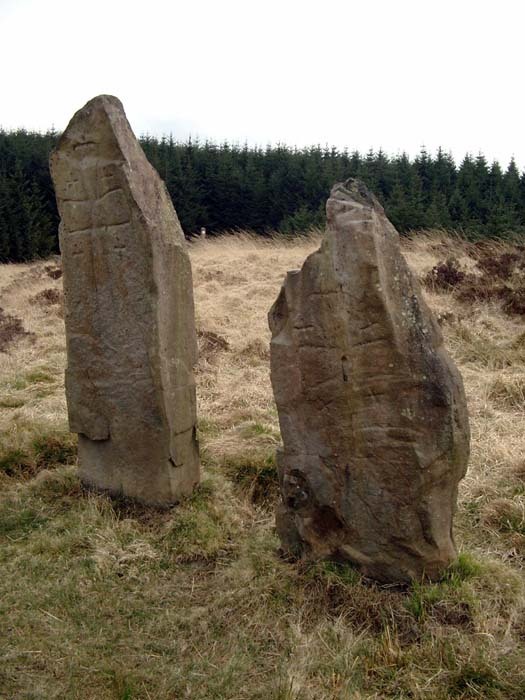 A steadier ascent led to the fork of paths at Pikestone Rig, where I met a couple strolling around the circular walk from St Mary's Loch. It's tempting here to take the short cut left fork, but the right fork is the correct route and leads down to the deserted Riskinhope Hope and up the side of Earl's Hill. This was an effort after quite a long walk, but was the last hill of the day so I ground up it quickly and was soon descending to St. Mary's Loch. As I approached Tibbie Shiel's Inn, the weather changed and it was soon raining heavily, but I was through the door before getting wet. Tibbie herself is long gone, having kept the inn in the mid-1800's. The inn became famous under her tenure, and the poet James Hogg and author Sir Walter Scott were regular visitors. 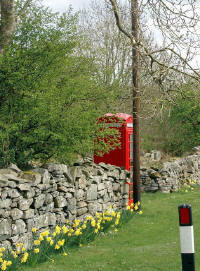 It is still thriving, although far from luxurious it provides cheerful company in this remote area. Chrissy was already established there, and I had plenty of time to wash, change and relax before retiring to the bar for a drink and some food which had arrived at the table after a journey from the freezer to the deep fryer. The ladies who I'd talked to earlier arrived, wishing that they were staying too - they had to sit in their damp clothes until their partners arrived with the transport. Although it seems like the soft option to stay in hotels and pubs rather than camp, it's such evenings that one reaps the benefits as I was dry and warm and had the space and facilities to tend to my sore toes. After Saturday's deteriorating weather, I'd expected a grim morning. However, it couldn't have been more perfect for a walk along the loch. 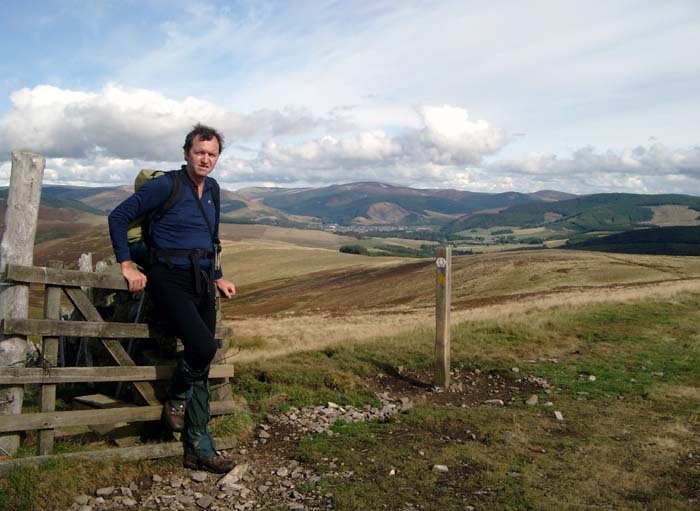 I arranged to meet Chrissy at Traquair - the plan was to drive from there to the next hotel (the Traquair Arms in Innerleithen) and enjoy a good lunch there before tackling the Minch Moor and Hog Hill sections to Galashiels. The walk along the bank of the loch was beautiful, and very quick as the damp grass and gorse held thousands of flies which rose into the air as I passed, and tried to follow me, necessitating a fast pace. 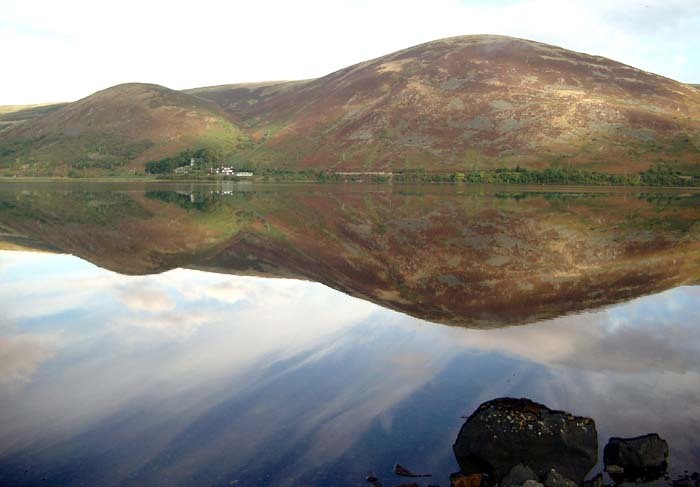 A few fly-free areas allowed stops to admire the shimmering water of the lake, with reflections of the hills that seemed clearer than the hills themselves. The loch is the product of glacial action: much in evidence around here. 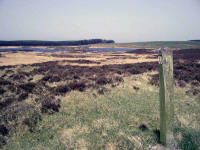 At the head, the path sets off over the hills to Blackhouse - there were many buzzards here, ranging over the open moorland. Dryhope Tower is passed, which was rebuilt after being destroyed as punishment for the Raid of Falkland in 1592 and appears to be undergoing another restoration. 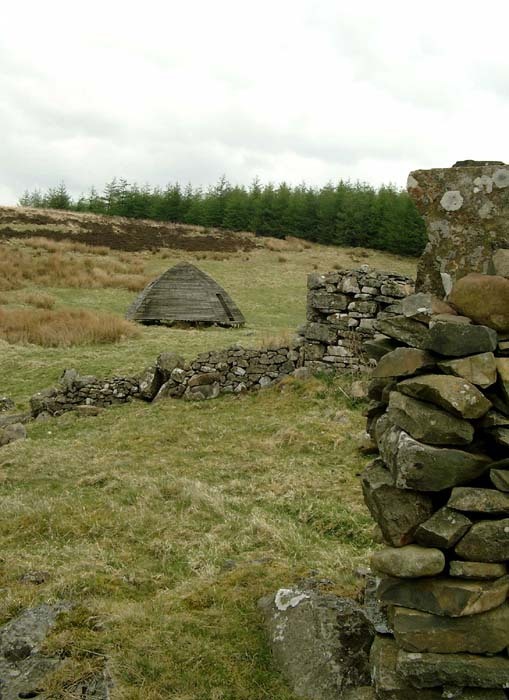 There is another tower at Blackhouse, which was used by Sir James Douglas ("The Black Douglas") in the 14th century, who was prominent in the battles for Scottish independence. James Hogg was shepherd here for ten years, and wrote of the great storms and snowfalls experienced at the time. A steep climb through forest soon led to open, sunlit meadows - perfect walking country and perfect weather with just a light breeze. I called Chrissy to tell her I would be slightly later than estimated, as my sore toes were becoming quite painful. Although I could keep a good pace going, I knew it was wise to avoid getting too ambitious and I decided to cut the day short at Traquair. 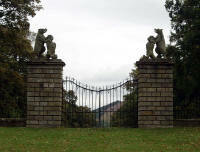 The amended plan was to have lunch as arranged, then visit Traquair House in the afternoon. As the oldest continually inhabited house in Scotland and with a long and varied history, it would seem a pity to press on without having time to look around the place. Chrissy met me at Traquair at half past twelve, and we had a good lunch at the excellent Traquair Arms before visiting the house. Particularly interesting was the collection of letters and manuscripts, and not least the recently-restored brewhouse! The Steekit Yetts are famous for never being opened since Prince Charles left in 1745, although this seems to be somewhat of a myth - I inspected them closely and could see that they have been opened recently! 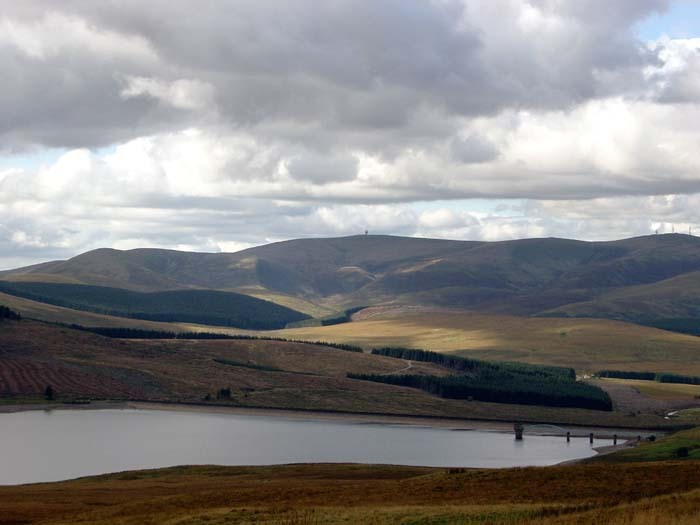 Minch Moor will have to wait until December - the next morning had been pencilled in for salmon fishing, but the Tweed was so lacking in water that a visit to Peebles seemed likely to be much more productive. Afterwards, sunny Peebles was followed by rainy Moffat then a long drag down to Liverpool for the 6.30 SuperSeaCat back to the IOM. I'd planned to leave the section from Melrose to Kirk Yetholm until the winter: the days are short and the weather may be foul but the land is mostly low-lying with plenty of shelter. Having avoided the Minch Moor stage last time, I was hoping that the forecast would be good for Saturday the 13th at least. In the event, the weather would be good for the three days although the Saturday was the worst. We arrived at Edinburgh Airport on Friday evening and the trip almost went off the rails straight away. I'd booked a hire car and brought the necessary driving licence but omitted to remind Chrissy that she'd need hers - after all, she'd be doing most of the driving. 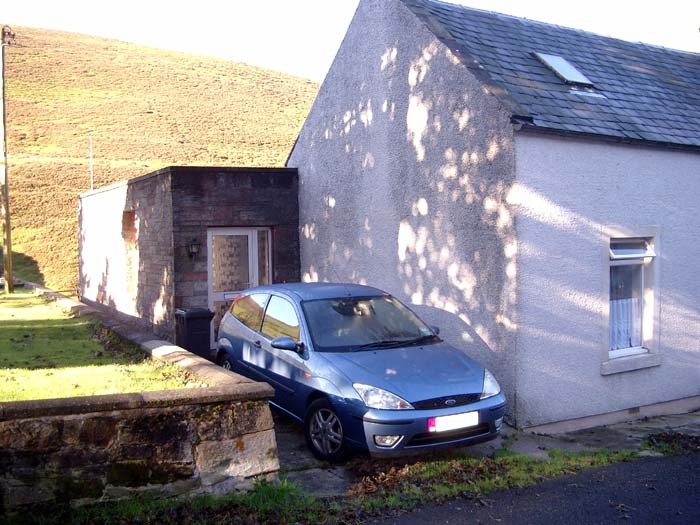 As her licence is a Manx one, there appeared no way round this as the IOM Government office would be closed for the weekend and there was no-one at home to send her licence out for us to try again the next day. Luckily, we realised that she could use her old UK licence - this would be valid and even though she didn't have it with her either a call to the DVLA was enough for Avis to authorise the car. This was a great relief, but not the last problem of the evening! Next we had to find the hire car - the aiport layout had been changed radically since I was last there (in April) so we did a lot of wandering about until we found the stop for the free bus service which takes people to the Car Hire pick-up zone. At last we were on our way to the night's accommodation - I'd taken the precaution of writing down directions, and the route looked fairly simple. 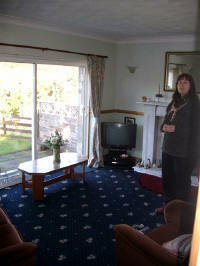 We were booked at Barony House, a B&B on the A701 just south of the city centre. 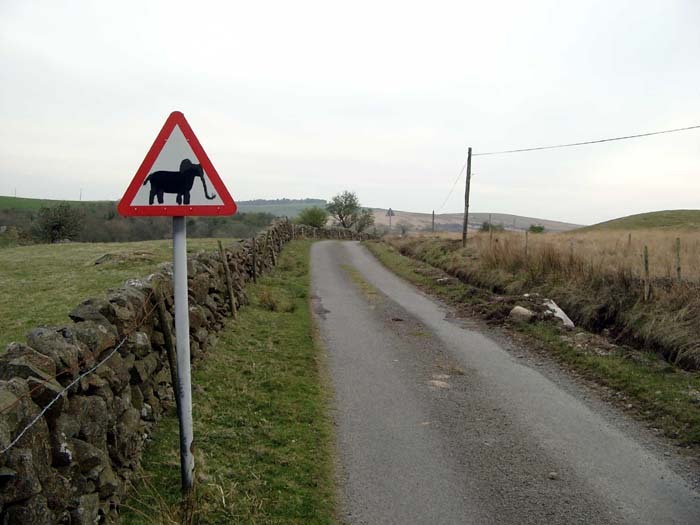 The directions took us easily to Torphichen Street, but with no road signs we quickly became lost. Three-quarters of an hour later we were still in the same area, looking for the B700, but eventually I decide to leave Edinburgh altogether and return from the south where there may be a sign for the A701. This worked, and we eventually found Barony House. With little of the evening left, we cancelled the visit to the city and opted for a meal at the nearby curry restaurant. The B&B had thoughtfully provided a guide to restaurants within walking distance - we chose this one mainly because it was the closest but it proved a good choice. 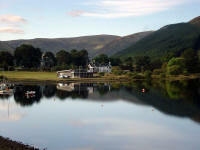 After an early breakfast, we were finally on our way to Traquair and arrived there at half past nine. Chrissy left me so she could visit Galashiels for Christmas shopping, and by 9.45 I was back on the E2. The weather was fair, with a stiff wind blowing showers quickly across the hills but with sunny spells illuminating patches of moorland here and there. 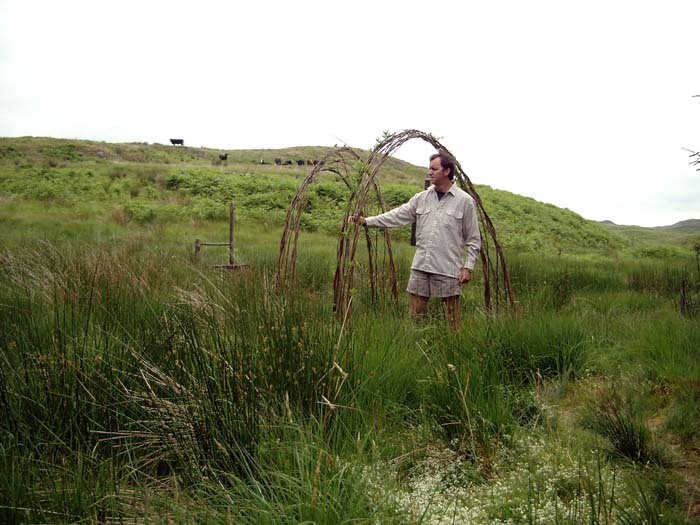 A stony track led uphill towards Minch Moor through plantations, but soon there is open moorland with perfectly-tended heather and a good wide path with enough turf to make the walking very easy. Despite looking out carefully, I missed the Cheese Well, and aslo could not find the kist which I knew to be in the area. 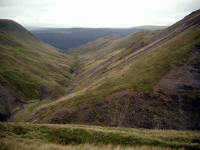 The good track continued over Hare Law and up Brown Knowe. The Yarrow Valley to the south is rich in history and mystique - Bowhill would be worth a visit to see the collection of paintings if nothing else. The 15th century Newark Castle was the scene of a brutal slaughter after a battle between the Covenanters and the Royalists in 1645. I passed three people on the path just east of Brown Knowe - unfortunately they were riding motorbikes which were cutting up the track very badly as the surface was loose and damp. 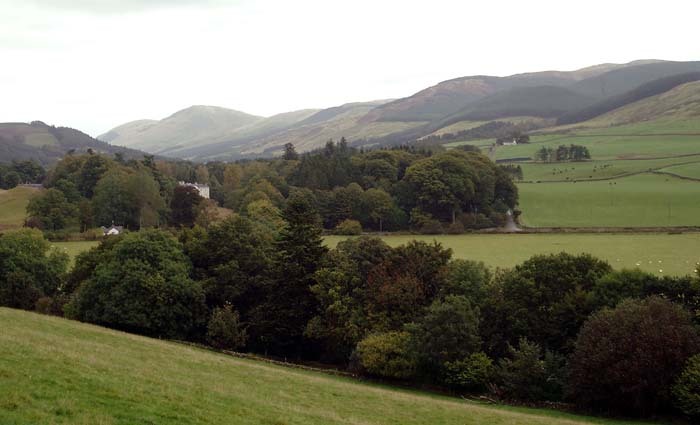 The way led to the end of the high ground at the prominent cairns of the Three Brethren - a steep descent took me through pleasant woodland and past the 1788 Yair House to the Tweed at Yair Bridge. After crossing the bridge (and busy road), the E2 led steeply up a farm track. Here, the showers I'd been lucky enough to avoid all morning suddenly caught me and I stopped to don waterproofs for the first time since Manquill Hill in July. With a strong wind at my shoulder and pouring rain I toiled up Hog Hill, but after half an hour the shower passed and I was able to remove the 'blinkers'. A grassy descent gave views to Galashiels - the town I'd wanted to reach on the first trip back in April had it not been for the ankle injury. 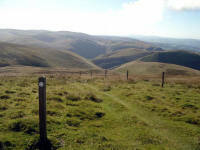 There was a diversion at the foot of the hill - the Southern Upland Way no longer turns away from Galashiels immediately here but now wanders around woodland near Galashiels Acadamy, which takes it closer to the town centre. I was suddenly feeling quite tired, and didn't really appreciate the extra distance of this route. From the Academy there is quite a pull up the side of Gala Hill to a fine viewpoint. I was tempted to think that Melrose was very near, as the two towns virtually merge in the Tweed Valley, but in fact there is a surprising distance between the two centres. I plodded wearily on, down to the Tweed and past the beautiful Abbotsford - built by the incredible Sir Walter Scott in the early 19th century. Rugby matches were just beginning on the riverside fields as it was just after 3 p.m. by now - there was a match at Gala RFC (apparently they beat Grangemouth 49-8) which was visible across a couple of lesser matches. With light fading, I needed to pull out a few stops to reach Melrose before dark. 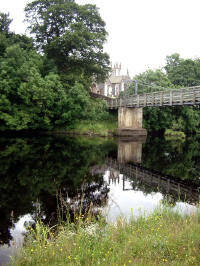 The path was suitable for this here, with a mile of tarmac railway bed passing in fifteen minutes and leading to a superb section alongside the Tweed where the river turns towards Melrose with a series of runs and pools. 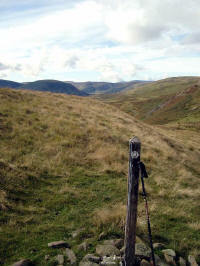 This was the end of the Southern Upland Way for me. although the Way itself continues for another couple of days' walk to the coast. 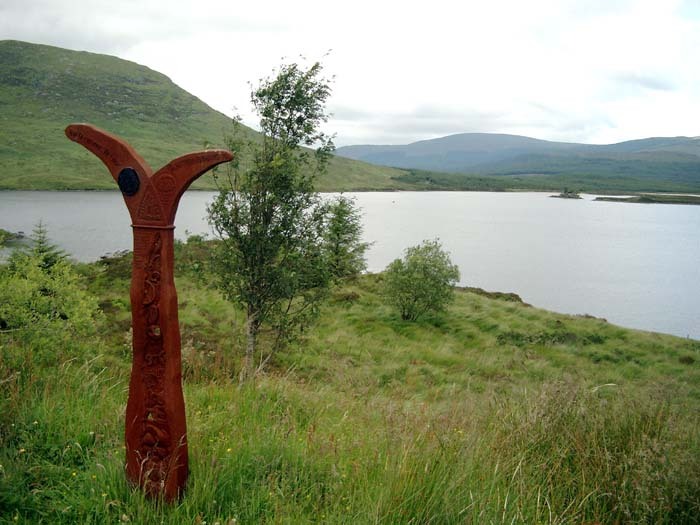 An excellent long distance footpath, the SUW has taken me through the most glorious Scottish countryside: without the obvious spectacle of the Highlands this region is ignored by the tourist but none the worst for that. The Way seems to be drawing in a trickle of visitors, however, who are helping keep villages alive and increase interest in this beautiful area. I hope the rest of the E2 is blessed with the excellent waymarking, well-maintained stiles and good walking surfaces found along the SUW, which have made the navigation simple and the map-reading more for interest than real necessity. Birch House was our lodging for the night, in the High Street in Melrose. I was soon soothing my tired legs in a lovely bathroom at this very warm and welcoming guest house. Chrissy had had a successful expedition to Galashiels and had found the town interesting - at least from a shopping point of view. 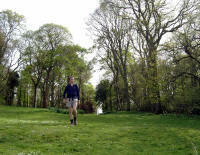 The Birch House proprietors, Chris and Julie John are keen walkers and very knowledgeable about the footpaths of the area. They also know how to cook a good breakfast! On Saturday evening, we ate at Burt's Hotel in the centre of Melrose - the food was superb and very good value. No complaints about Melrose at all, a beautiful little town.